Harrisville Town Hall is located at 705 Chesham Road, Harrisville, NH 03450; phone: 603-827-3431. Photo: Aldworth Manor, ca. 1908, Aldworth Street, Harrisville, NH. Listed on the National Register of Historic Places in 1986. Photographed by User:Magicpiano (own work), 2012, [cc-by-3.0 (creativecommons.org/licenses/by/3.0)], via Wikimedia Commons, accessed August, 2014. The History of Harrisville reaches back to the town's date of incorporation: 1870. However, an additional earlier century must be added to record the activities of persons of European descent within the town's current boundaries. Pre-1760: Native Migration, during which native Americans are known to have migrated through what would later become Harrisville, camping temporarily on terraces overlooking local bodies of water. 1760-1800: Early Agricultural Settlement, during which a handful of young and adventurous immigrants of European descent from Massachusetts and elsewhere in New Hampshire were lured by strong inducements offered by the Masonian proprietors to "perform the duties of settlement" on rocky Harrisville hilltops. In addition to establishing their self-sufficient farmsteads, they had cleared several roads by the end of the Revolution, organized a Baptist Society, and started three milling operations and two potteries by the turn of the 19th century. Seventeen buildings, all but one residences, which were entirely or partially constructed during this period survive. 1800-1823: Agricultural Self-Sufficiency/Early Industrialization, during which hill farmsteads multiplied and thrived, often becoming the sites of small cottage industries which were frequently textile-related. Pottersville, in southwest Harrisville, grew in size and reputation as did a large sawmill, wheelwright and woodenware manufactory nearby. By 1823, textile milling operations at Twitchell's Mills (Harrisville village) had become a complete, self-contained woolen cloth manufacturing operation with a factory in place. 1823-1850: Industrial Consolidation/Early Agricultural Decline, during which agricultural decline was given a brief reprieve locally by "sheep mania" and Harrisville village's industrial character was firmly established by the construction by the Harris family of two new mills, one brick and one granite. Both mills were supported by a full complement of auxiliary structures. Housing needs were satisfied by a flurry of new construction, including brick Neo-Classical homes for mill owners Cyrus, Milan, Almon and C.C.P. Harris and Abner Hutchinson, and a handful of other dwellings, all wood frame. Several social, commercial, and institutional buildings were built during this period. Residences were also built in Pottersville, while some hill farms were facing abandonment. Eastview, still agricultural, became the location for the Dublin Town Poor Farm. 1850-1870: Supremacy of the Mill Village/Industrial Boom, during which rapid expansion of the Harrisville mills was stimulated by the Civil War. The most significant addition to the mill village's building inventory was a full complement of mill workers' housing, the overwhelming majority of which survives. (The Cheshire Mills Company's major building campaign raised the number of houses in the village to 60.) Pottersville, from which the pottery industry has vanished by the end of the period, stabilized at approximately two dozen houses, while Chesham Village and Eastview grew even smaller. 1870-1900: Industrial Fluctuation/Influx of Summer Residents, during which Harrisville incorporated as an independent town over the issue of the railroad. The mill village doubled its housing stock and population since 1860. Its residents established a Roman Catholic parish to serve Irish and French Canadian mill workers and built its church. Farming continued to decline despite a relatively brief interest in dairying. 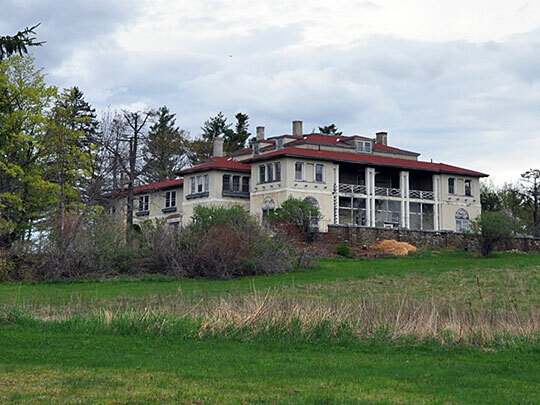 An influx of summer residents drawn by a pastoral setting made accessible by the completion of the railroad was the most significant development in the years immediately prior to 1900. 1900-1915: The Supremacy of the Summer Resident, during which village life suffered from the consequences of economic uncertainty and a population decline and saw the arrival of a group of Finnish mill workers and their families. A major impact was left on Harrisville's landscape as well as its economic and social life with the arrival of summer residents ranging from the wealthy and powerful of New York and Massachusetts, who built large architect-designed mansions, to businessmen from Keene and Marlborough, who built picturesque cottages at Silver Lake. 1915-1940: Social Quickening/Industrial Survival, during which the number of summer residences more than quadrupled, summer residents took an active role in the improvement of the village and the Cheshire Mills Company struggled for survival while all other smaller local milling operations were eradicated. Marcia M. Cini and staff, Historic Harrisville, Inc., Harrisville MRA (Historic Resources of Harrisville, New Hampshire), nomination document, 1984, 1986, National Park Service, National Register of Historic Places, Washington, D.C.